Many people choose fish as a pet because of their low maintenance. Then they realize the fun that comes with setting up an aquarium. Making a home for your fish can be fun and inexpensive. When addition you can make to your aquarium to create a healthier environment for your fish is an aquarium heater. Usually, heaters are used for tropical fish however in cold climates can be used for temperate aquariums also. Keep in mind that any fish in your aquarium cannot maintain their own body heat. If you have a tropical tank a heater is almost non-negotiable. You can also find yourself needing a heater if you live in particularly cold climates. Since fish cannot regulate their own body temperature and have a small window of livable temperatures you could be significantly impacting the lives of your fish by not having a heater. Safety is always a top priority. Don’t forget you’re bringing an electric, heating element into a water environment. Safety for your fish starts with a few options. Either an external filter such as an in-line or in-filter option or a fish guard. Many aquarium heaters come with a fish guard if they are at risk of your fish interacting with them. Similar to other animals, fish and aquatic life are drawn to heat. So, it isn’t uncommon for fish to show interest in a new heater. Safety for you has primary aspects to consider. First, that the risk of electricity is removed or as low as possible. Second, that risk of shattering within the tank or filter is minimal to prevent electrical shorts. Finally, that your heater is positioned to show any present thermometer and reduce electrical risk. The positioning is key and changes with each type of heater. For an in-line or in-filter heater, you want to be sure that your heater is connected appropriately. Because it is interacting with moving parts it’s important to read the manufacturers instructions completely before installation. For submersible, substrate, or hanging back heaters you should consider where your water columns are within your tank. Maximizing the heat distribution and positioning safely are both accomplished by placing the heater at the bottom of a powerful water flow. When factoring in the aspects of size allowance and heat distribution there is some personal preference here. If you have a small tank, on a small tank stand with no cabinets you probably won’t benefit from a bulky external heater. Just the same, if your tank is large you’ll probably need more power and heat distribution than what a back-hanging heater can offer. Use this list to help you find which features you value most in a filter! These top 8 picks were chosen after careful review and consideration of their features and the value they could bring to your tank. This list is diverse and there should be something for every budget and every tank type! 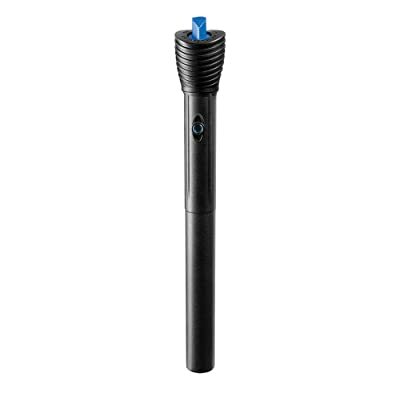 This is a submersible heater from a well-known brand and is the first pick in the top five. Made for aquariums ranging from 26-40 gallon tanks this could be a great starter for many new aquarium enthusiasts. To keep your tropical tank at prime temperatures this heater recalibrates with a TruTemp dial for consistently accurate temperature regulation. Why is this a top feature? Well, if the thermometer in your heater isn’t correctly calibrated then you’re heating your tank to the wrong temperature. Knowing that there is a built-in calibrator for the thermometer is a peace of mind. If your only goal with a heater is to keep the temperature of your tank at a single temperature for all of the time, this could be the right heater for you. 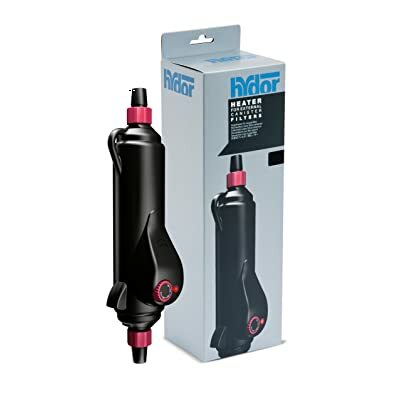 The final say on this product is that it is a good value, but takes into consideration it is for smaller tanks. It being submersible means it will generally be more efficient and accurate. In addition, it has a visual indicator showing whether it is off or on. Many heaters don’t have this feature which makes this one a bonus! Available in a variety of sizes to accommodate different tank sizes, this is an external heater worth looking at! The size of the product for a submersible heater is hands down the best thing about it. The Hydor In-Line External Heater sets behind the aquarium easily. It doesn’t clutter and keeps the temperature very well for an external heater. Fluval is a well-known name among aquarium enthusiasts. Usually associated with filters of all shapes and sizes, they deliver similar quality and diversity in heaters. This one is a 300 Watt heater meant to accommodate aquariums up to 100 gallons in size. However, this same model comes in a variety of wattages to better fit smaller tanks as well. The best feature of the Fluval heater here is the dual temperature sensors which work together to give an accurate water temperature. It then displays a digital, LCD readout of the temperature for easy checking. It can display in Celsius and Fahrenheit. The temperature control is also precise down to half of a degree making adjustments easy. This is a valuable feature for both ease of use and the safety of your aquarium. If you have tropical fish that can be very temperamental to temperature changes, something with a digital readout is definitely recommended. However, if you’re looking for a heater for a temperate aquarium to maintain the temperature this filter may be a bit out of your budget. As with any submersible heater, this one works best when it’s near a flow of water. Placing it strategically at the bottom of a water column will ensure even distribution of heat throughout the tank. The Fluval E 300 Watt Electronic Heater uses an extra sensitive temperature sensor that is as accurate as a probe thermometer. It samples the water through the heater tube giving some of the highest accuracies in submersible heaters. Overall, there isn’t an area that this heater doesn’t deliver in. Using all the information and feedback, this is definitely worth the value of it. However, it is pricey when compared to the other filters on this list and may not fit into your budget. Safe for salt and fresh water which is great because most aquarium heaters aren’t flexible. The Aqueon Pro Heater Aquarium Heater is a great place to start and is reasonably priced! If you’re not sure if a heater is in your budget, this could be a good place to start. As a fully submersible aquarium heater, the Aqueon heater shines because of the high-quality materials it’s made of. The materials have ensured that it is shatterproof, safe for your fish and has a long-lasting power light indicator as well as a thermostat. Aqueon has put their priority on quality and delivered. This could be the heater that lasts for years if you get the appropriate wattage for your tank. It is typically suggested to go slightly higher in wattage than is generally recommended by the manufacturer to compensate for a heavy fish population. The quality here is nearly unbeatable, although it doesn’t have all the bells and whistles that we’ve seen from other heaters. The Tetra HT is another submersible heater that has a few options in wattage for different tank sizes. Thermostat additions are always appreciated and there isn’t a huge price increase for the extra perks this little heater has! Hands down the thermostat on this heater is its best feature. Not just because it displays the temperature which is nice, but its sensitivity sets it above the competition for heaters in this price range. The thermostat here is calibrated to near perfection and detects when to jump into action. Although it is made for smaller tanks, new aquarium enthusiasts can enjoy a place-it and forget-it mindset with this heater. For the price, this is nearly unbeatable. It offers all of the basic values mentioned in the values section above. It’s averagely safe, small in size and in a small tank can distribute heat effectively. 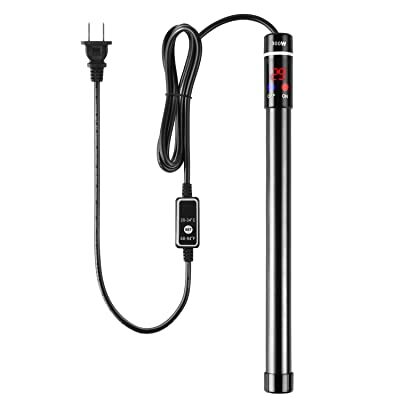 Pedy Aquarium Heater 300W is a titanium submersible aquarium heater with a floating thermometer and intelligent LED indicator. This aquarium heater uses high heat transfer efficiency of titanium alloy, and this makes the time of heating shorter. Its wattage is also great for fifty to sixty-gallon large fish tanks. This makes it an ideal option if you are looking for the best fish aquarium heater for large tanks. The heating temperature of the heater also ranges from 68 to 93 degree Fahrenheit. 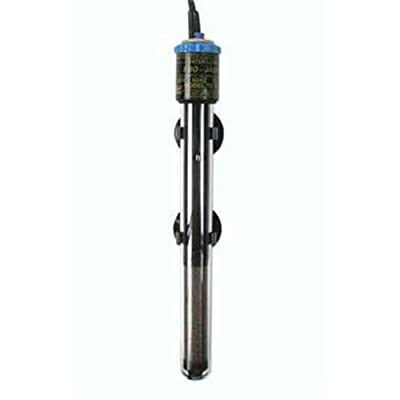 This aquarium heater is made of high-quality titanium alloy, insulation Teflon, and double seal material, providing IP68 waterproof, shatterproof, scald-preventing, explosion-proof and secure operation. This aquarium heater features a shatter-resistant construction, and it is anti-corrosion whether you use in a freshwater or saltwater fish tank. This titanium submersible fish tank heater also automatically shuts down the power to prevent damage or overheating, providing your plant or fish with a healthy and secure environment. The heater will shuts down automatically when the water level in the fish tank is too low. It also comes with two suction cups which enables you to attach the heater to your fish tank. The aquarium heater can either be placed diagonally or vertically in the water. The Cobalt Aquatics Neo-Therm Aquarium Heater has been around for some time. It’s available in different watts including 25W, 50W, 75W, 150W, 200W, and 300W. This means you can go for the option that best suits the size of your fish tank. 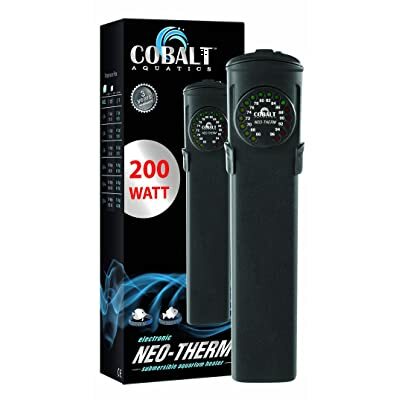 This aquarium heater gives you the freedom to set the range of the temperature between 66 and 96 degrees Fahrenheit, and it can maintain the temperature of your water within 0.5F. This aquarium heater features a super slim, modern design that does not alter the look and feel of your fish tank. The system is also very easy to set up, as it features an easy to set “one touch” control system which is quite easy to access. The component also uses light emitting diodes to display both the present temperature of the tank and your set/desired temperature simultaneously. When you set in the temperature you want, it will continue flashing an amber light until your desired temperature is met. The heater can be submerged fully in water, and also shatterproof, so you don’t have to worry about cracked glass. It has a thermal protection system that shuts down the heater to prevent overheating. The Finnex Electronic Controller Aquarium Titanium Tube with Heater Guard is one of the most popular aquarium heaters in the market. This aquarium heater is highly flexible, as it comes in various sizes including 300W Deluxe, 500W Deluxe, and 800W Deluxe. The particular wattage to opt for will depend on the size of your tank as the 300W is ideal for 40 to 80-gallon tanks, the 500W is ideal for 70 to 130-gallon tanks, and the 800W is ideal for 140 to 265-gallon tanks. This aquarium heater is made of titanium heating tubes which are corrosion resistant and are practically unbreakable. It is made up of high-quality materials which makes it suitable for both freshwater and saltwater fish tanks. The titanium coating will resist damages some conventional heaters normally encounter. It also offers another level of protection by guarding the heater with a plastic coating, protecting livestock, as well as other pieces of equipment, from having direct contact with the heating tube. This heater comes with suction cups that allows you to securely place it on your tank, in any position that you want. The tubes of this heater are built to last and may last for a very long time if used and managed properly. Before choosing any type of aquarium heater you definitely need a thermostat first. This thermostat will give you a readout of your aquariums current temperature. Well, many of the aquarium heaters on this list have a thermostat if you have a large tank it’s recommended to have to in separate areas of the tank where water temperatures may vary. An inline aquarium heater is an external unit that either set inside a canister filter or next to an external filter. The concern with these is that they can quickly become bulky and take more space then you have set aside for your filter. Inline heaters use the water pump of the filter to push the water through them heating it as it’s returned back to the Aquarium. These work best with canister filters trickle filters or a UV sterilizer. In filter aquarium heaters are often found inside canister filters or power filters. 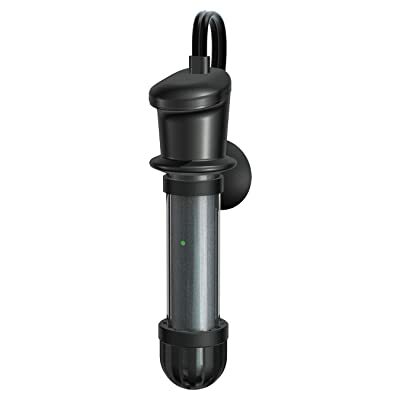 These heaters are usually built-in and they heat the water as it comes into the filter so in the water is returned to the aquarium it is both clean and warm. Hanging aquarium heaters are a popular option they’re the most common and usually the cheapest. But we’ve seen through the search for value that the cheapest option does not always mean you’re getting the most out of your dollar. Hanging aquarium heaters usually require a little alteration to your tank cover. Usually, there’s a small slot that you can pop out or easily cut through to install a hanging aquarium heater. 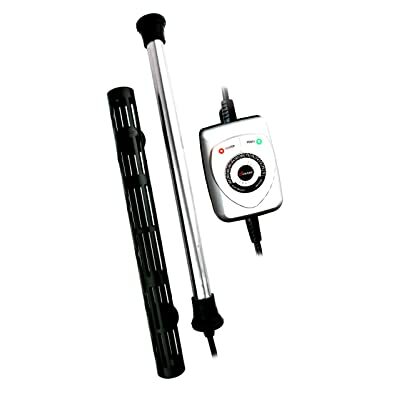 Submersible heaters are a popular option among well-seasoned aquarium enthusiasts because they sit entirely in the water and can heat the aquarium more efficiently. Typically these heaters are placed in the bottom of a water column that has some water flow that way the heat is directed evenly throughout the tank. The only note on safety here is to keep the submersible heater away from the gravel. When the gravel hits the heater it can conduct heat between the two and eventually the glass will crack. Some brands have started building submersible heaters with shatterproof glass or greater resistance to heat building. These safety features aren’t available on all filters but most valuable filters have made these adjustments. Aquarium Enthusiast normally stays away from substrate heaters except for occasionally on larger tanks. What a substrate heater uses to heat the tank is a coil or wire that is varied underneath the gravel of the tank. Using this element for the heater the coil or wire becomes hot then the heat radiates upward through the gravel and the water becomes warm eventually the thermostat will switch the heater off when it’s hit its peak temperature. Most people go with substrate heaters when they have fully planted aquariums. Planted aquariums benefit because the plant’s roots need a temperate climate also. By keeping the gravel warm the root systems are kept moderately warm in the substrate underneath the gravel. Fish and turtles are cold-blooded animals, and as a result of that, they can’t regulate their body temperature just like mammals do. You need to provide them with an optimum temperature for them to thrive and remain healthy. This is the problem aquarium heaters are designed to solve. But the issue with settling for one comes when consumers are faced with the overwhelming choices in the market. Listed below are some of the things you need to consider when choosing an aquarium heater, this will help streamline the entire process for you. There are different sizes of aquarium heaters out there, and the size you’ll choose depends on the size of your aquarium as well as the quantity of water in it. So you need to know the size of your fish tank, as it plays a vital role in your choice of heater size. Generally, a 25W heater is ideal for 5-gallon tanks, and 50W for 10-gallon tanks. So the Larger your fish tank, the larger the size of heater you’ll settle for. You also need to put your budget into consideration when choosing an aquarium heater. Make sure you put the amount you are willing to spend into consideration before stepping into the market because heaters come at a wide range of prices. This is another vital thing you need to consider. You can decide to place the heater at the middle or end of the tank. Your placement position will also play a vital role in the kind of heater you want to opt for. The best place for a heater in an aquarium is close to the inflow; this will ensure the water is heated evenly. Maintaining and cleaning an aquarium isn’t an easy task, and this also applies to heaters. As a result of this, it is crucial that you go for an aquarium heater that is easy to maintain and clean. The Fluval E Electronic Heater might not be in everyone’s budget but it’s the best value on this list. Its fluctuation in size could be beneficial also as a size that suits your aquarium may be more budget friendly. What made the Fluval take the win on this one was the fish guard and shatterproof design. The same design is available in 50, 100, 00, and 300-watts. This means it’s flexible for your tank size and heating needs. The quality of the materials also helps it deflect damage from corrosion. To top it all off, the extra value is in the temperature setting. Aquarium enthusiasts know what their tank needs and this heater lets you control your aquarium.